Our laboratory e-learning program provides your employees with the skills needed to manage and control ergonomic risks in the laboratory environment. If used incorrectly, laboratory equipment, tools and instruments can cause stress and strain on muscles and joints, leading to undesirable injuries. Our interactive e-learning course is designed to help reduce the risks in this specialized environment and teach lab technicians the harmful movements & activities to avoid. 30-40 minutes of e-learning that encourages your employees to make adjustments to their workstations and equipment as they take part. All laboratory ergonomics assessment training is customizable to meet the exact needs of your company. 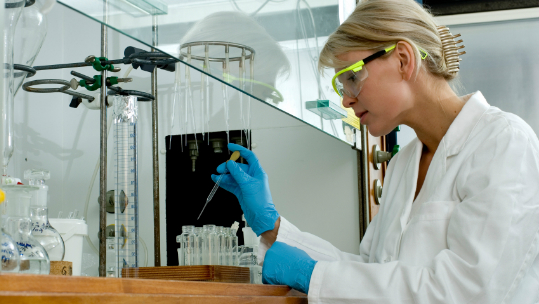 Employees conduct their own laboratory ergonomics risk assessment and are given immediate feedback and advice for issue that they can resolve themselves. This provides them immediate help and reduces the amount of risk your ergonomics assessors have to carry out.. Automated communication ensures your laboratory ergonomic risk assessment program becomes proactive and encourages employees to engage. Your ergonomics team can use our powerful management system to assess and resolve any residual risk. This ensures intervention is targeted, appropriate and result-driven. In one laboratory environment changes were made to the work flow to reduce the risk of musculoskeletal disorders, Cardinus consultants found evidence that the training paid for itself in less than three months through an increase in productive hours and reduced work in progress, as well as resulting in a reduced risk of injury and absence from injury and illness.